Qin, C., et al. Effects of Carbohydrates on the Toxicity of p-Aminophenyl Arsenoxide against S. cerevisiae. (2017) J Med Chem Toxicol 2(1): 28- 33. © 2017 Qin, C. This is an Open access article distributed under the terms of Creative Commons Attribution 4.0 International License. The effects of carbohydrates on the toxicity of p-Aminophenyl arsenoxide (p-APAO) against S. cerevisiae were investigated by Microcalorimetry, including glucose, fructose, lactose, sucrose, N-acetyl glucosamine, 1,3,4,6-tetra-O-acetyl-D-glucosamine (OADG), and chito-oligomer. The toxicity of p-APAO on S. cerevisiae decreased in the presence of OADG or chito-oligomer. Among the test carbohydrates, the antagonism of OADG was better than those of other sugars. 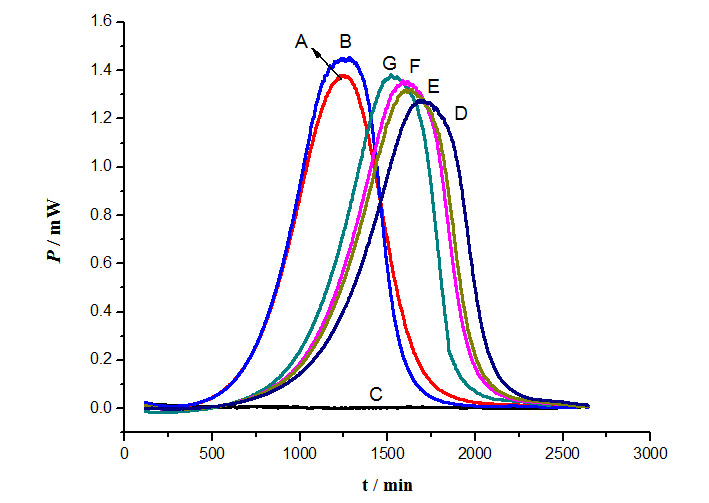 These results suggested that OADG and chito-oligomer were p-APAO antagonists. Carbohydrates could form complex with p-APAO to prohibit p-APAO from polymerizing. This result was attributable to hexose carriers not recognizing the p-APAO effectively. Since arsenic trioxide was used to treat acute promyelocytic leukemia remarkably effective, scientists have been working on it and its derivatives treatments to variety of other types of cancer[1-3]. Though it is controversial in many applications with high toxicity, Food and Drug Administration of American (FDA) approved it as the treatment of acute promyelocytic leukemia in 2000. In order to overcome some of the shortcomings of arsenic therapeutics with low dose, high toxicity, especially limited dose to the solid tumor in clinic, scientists tried all kinds of ways to decrease the toxicity of arsenic chemicals[4-8]. These methods included: 1) Designing new kinds of inorganic or organic arsenic chemicals; 2) Using other compounds or medicine with arsenic trioxide as combination therapy to both reduce the toxicity of arsenic chemicals and enhance the curative effects. Recently some new types of inorganic and organic arsenic (III, As) compounds with good biological activity have been synthesized. Most of them based on arsenic trioxide or p-aminophenyl arsenoxide (p-APAO)[4-7,9] which could be prepared from the commercial goods 4-arsanilic (V, As) acid as the pig feed additive. Arsenic trioxide has been applied in clinic with other compounds to cut down its toxicity[11,12]. If the acute toxicity of arsenite is reduced, its range of application would be enlarged. Our previous work indicated that chito-oligomer and glucosamine have significant effect to lower the toxicity of arsenic trioxide. In fact organoarsenic (III, As) compounds are less toxic than inorganic arsenic compounds such as arsenic trioxide (III, As). Some of them would be the candidate of new anticancer drugs. To find some substances with the function of lowering the acute toxicity of organic arsenic compounds and strengthening their therapeutic effect is a promising research topic. Based on the above ideas and results of our previous studies we chose the carbohydrates as our objects to study the effects on the organoarsenic compound p-aminophenyl arsenoxide (p-APAO). These carbohydrates included: monosaccharide, disaccharide and chito-oligomer. Glucosamine could be commercially available through the hydrolysis of chitin, which composes the exoskeletons of crustaceans and other arthropods, cell walls in fungi and many higher organisms. Due to its safety and effectiveness, glucosamine has been approved very popularly as a dietary supplement in almost all countries[15,16]. Chito-oligomer with non-toxicity and good water-solubility is the oligomer of glucosamine, which can be obtained by degradation of chitosan. It has various biological activities such as antitumor and immune-enhancing effects[18,19]. Microcalorimetry currently is one of the most important techniques in thermochemistry and thermodynamic studies due to its high sensitivity, accuracy, and its non-invasive, non-destructive nature. It also allows real-time, on-line and automated analysis[20-25]. One of the most prominent characters of the growth of the microorganisms is the production of heat. Microbial activity could be quantified through detecting the heat output accompanied all the biochemical oxidation-reduction reaction. Based on detection of microbial cells’ metabolic heat microcalorimetry is an important tool to evaluate their growth activity in quantity and quality. When the heat is detected and recorded by microcalorimeter as small as a microwatt, the useful information in quantity and quality could be obtained. This method affords us the information about the bacteriostatic and bactericidal effects of different chemicals. Chito-oligomers could decrease the inhibitory effect of arsenate, selenite and fenaminosulf on microorganism growth[27,28]. 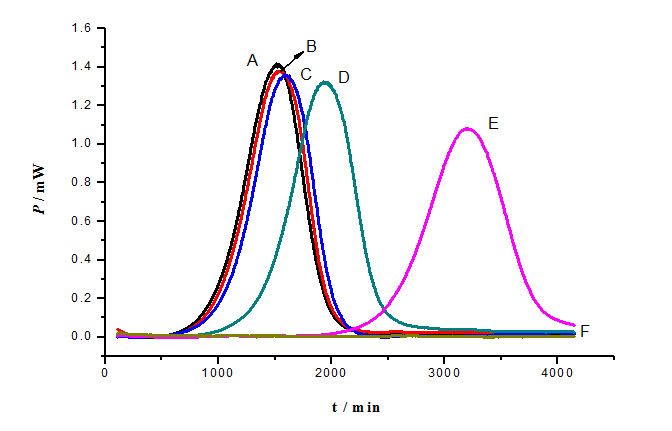 In this paper we investigated the effects of some monosaccharides, disaccharides and chito-oilgomer on the toxicity of p-APAO against microorganism such as S. cerevisiae via the microcalorimetric method. As (III) transport in the yeast have been studied. 80% of As (III) can be taken up by hexose carriers in S. cerevisiae, which is the also the main channel of acute poisoning by arsenite (III) compound. To our surprise, the toxicity of p-APAO on S. cerevisiae decreased in the presence of OADG, chito-oligomer. Among the detection carbohydrates, the antagonisms of OADG and COS were better than those of other sugars. The chito-oligomer sample (COS) with weight–average molecular weight (Mw) 1.4 × 103 was prepared in our previous method 16. 4-arsanilic (V, As) acid was supplied by Tokyo Chemical Industry with a purity of no less than 98%. Chemicals we synthesized have a purity of no less than 98%. All other chemicals were of analytical grade. S. cerevisiae was provided by Microbial genetics laboratory, College of Life Sciences, Wuhan University, China. The strain was grown to the stationary phase in nutrient broth at 28°C. Yeast extract peptone dextrose medium (YPED medium), consisting of peptone 10 g, S. cerevisiae extract 10 g, glucose 20 g, per liter, pH 7.0, was sterilized by autoclaving for 20 min at 115°C. NMR spectroscopic data were recorded with a Bruker Avance 400 spectrometer. Mass spectroscopic data were recorded with Waters Acquity UPLC Class I/Xevo G2Q-Tof. The p-APAO was synthesized according to the literatures (Scheme 1)[30,31]. Compound 2 was obtained as white solid in yield of 90% (8.27 g). It reacted with 10% aqueous ammonia. Then the solution was filtered, washed with water and dried under vacuum. Compound 3 (p-APAO) was obtained as white solid in yield of 67%. 1H NMR (400 MHz, DMSO-d6) δ ppm 7.88 - 7.86 (d, J = 8.0 Hz, 2H), 7.46 - 7.44 (d, J = 8.0 Hz, 2H). The data were agreement with the literatures. OADG hydrochloride was synthesized according to the literature (Scheme 2). It was obtained as white solid in yield of 97% (29 g). 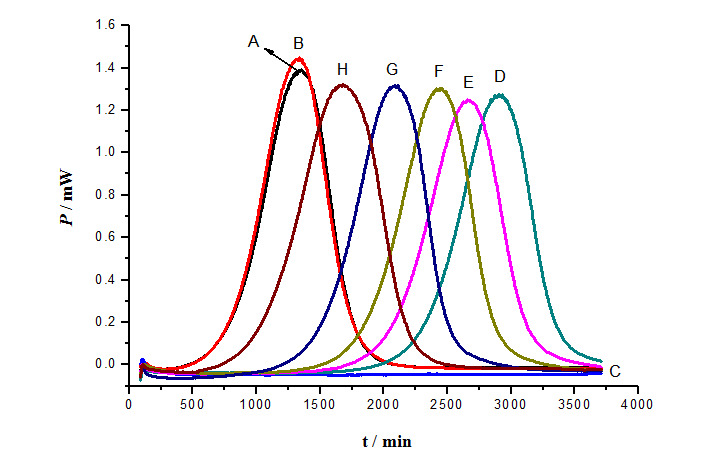 1H NMR (400MHz, DMSO-d6) δ ppm 8.82 (brs,3H), 5.94 (d, J = 8.8Hz, 2H), 5.38 (t, 1H), 4.96 (t, 1H), 4.24 - 4.20(m, 1H), 4.09 - 4.01(m, 2H), 3.59(t, 1H), 2.20 - 1.89(m, 12H). HRMS (ESI): [M-Cl]+ m/z calcd for: C14H22NO9, 348.1295; found: 348.1290. These data were agreement with the literature. Scheme 2: Synthesis of 1, 3, 4, 6-tetra-O- acetyl-β-D- glucosamine hydrochloride. The effect of p-APAO on S. cerevisiae was investigated by TAM air, which was an eight-channel isothermal batch calorimeter for heat flow measurements. The metabolic growth power-time curves of microorganism in 20 mL ampoules were obtained, and the experimental data were recorded by TAM Air Assistant. The 1.0 mg/mL As (III) bulk solution was obtained by adding 244 mg p-APAO into sodium hydroxide water solution, and diluted to 100.0 mL with volumetric flask. Before each batch experiment, the As (III) solution was adjusted to pH 7.0 by HCl. The inocula was homogeneously distributed into 50 mL of Luria-Bertani medium (LB medium) by gentle shaking to obtain the suspensions. Figure 1: Structures of carbohydrates. The 4.0 mL of the suspensions was added into each sterilized ampoules. The requested As (III) solutions were added by micropipette. Then the weighed carbohydrates were added into the sterilized ampoules, respectively. Sterilized water was used as a control instead of the sample. The pH of the mixture in each ampoule was adjusted to 7.0 by adding 1 mol/L HCl or NaOH. The liquor volume in each ampoule was adjusted to 5.0 mL by adding sterilized water. The ampoules were sealed tightly and shook for 3 min. The ampoules were placed in the calorimeter and signals obtained during growth were detected. The experiments were run at 28.00°C. Each batch experiment was carried out at least three times. Power-time curve for the growth of S. cerevisiae was shown in Figure 2a (A), which is a typical growth curve for S. cerevisiae and can be divided into four phases: lag phase, active recovery phase, stationary phase and decline phase. The calorimetric power (P), which reflects the multiplication of the cells, can be used as a parameter to characterize the growth of the bacteria. Since the area under the curve represents the total heat (Q) released during the experimental period. During the active recovery phase increases exponentially, the power-time curves obey the following equation: Pt = P0 exp (kt) or ln Pt = ln P0 + kt, where Pt is the power output at time t, P0 is the initial power output, and k is the growth rate constant. Power-time curves for the growth of S. cerevisiae in the presence of As (III) were displayed in Figure 2. It shows the power-time curves for the growth of S. cerevisiae at 28°C in the presence of As (III) different concentration. As (III) had the ability to inhibit the growth of S. cerevisiae to a different extent. The inhibitory effects of As (III) increased at the concentrations ranging from 10.0 mg/L to 80.0 mg/L. With the increase concentration of the drug, the growth of S. cerevisiae became more slowly. When the concentration of As (III) increased to 80.0 mg/L, the power-time curve became a straight line, indicating that S. cerevisiae growth was completely inhibited. Figure 2: Effect of different concentrations of p-APAO on the S. cerevisiae: A: Control; B: 10 mg/L As; C: 20 mg/L As; D: 40 mg/L As; E: 60 mg/L As; F: 80 mg/L As. Due to the concentration of As (III) increased to 80.0 mg/L, the growth of S. cerevisiae was completely inhibited. So under the concentration of 80.0 mg/L As (III) all the power-time curves of the control C were almost straight lines in Figure 3 and Figure 4. The second control was that the power-time curves in the presence of 4 g/L OADG, 4 g/L COS, which had no obvious influence on the growth of S. cerevisiae in YPED medium. YPED medium is optimal medium for the growth of S. cerevisiae. To further illustrate the influence of different carbohydrates to p-APAO (80 mg/L) on the growth of S. cerevisiae, the power-time curves of the different concentrate about the same carbohydrate was tested (As shown in Figure 3 and Figure 4). In contrast to control A (which was the normal growth of S. cerevisiae in YPED medium.) in the presence of 80.0 mg/L p-APAO different concentrations of OADG, COS were added to the solution. Power-time curve for growth of S.cerevisiae appeared again, which stands inhibitory effect of p-APAO on the growth of S. cerevisiae reducing. The power-time curve was closer to control A, the detoxification was better. The results showed that they reduced the inhibitory effect of p-APAO on the growth of S. cerevisiae. The inhibitory effect of p-APAO on the growth of S. cerevisiae decreased with the increased concentrations of OADG (Mw 347) and COS (Mw 1.4 × 103, if it is discounted to monosaccharide 177), respectively. These results suggested that OADG and COS could lower the toxicity of p-APAO on S.cerevisiae. 10 g/L of COS was almost equal to 20 g/L OADG, if these two concentrations are converted into molar concentrations, they are same molar concentrations. Actually the effect of 12 g/L OADG is almost the same of 10 g/L of COS (Figure 3 and Figure 4). This result indicated that OADG has the better capacity of detoxification to p-APAO than COS. The inhibitory effect of p-APAO (80 mg/L) on the growth of S. cerevisiae was influenced by different carbohydrates (12.0 g/L), and the power-time curves were shown in Figure 5. Sucrose, fructose, lactose, glucose and N-acetylglucosamine had slight influence on the inhibitory action of p-APAO on the growth of S. cerevisiae. But the power-time curve of OADG was the closest to blank control, which stands the best reduced arsenic toxicity effect on S. cerevisiae. The results demonstrated that OADG could dramatically promote the growth of S. cerevisiae, whereas other carbohydrates did not display remarkably effect on the growth of S. cerevisiae. So OADG had the greatest inhibitory effect on the p-APAO against the growth of S. cerevisiae among these six carbohydrates. The control tests in the absence of p-APAO indicated that these carbohydrates had no promoting effect for the growth of S. cerevisiae (the power-time curves not showed). These results suggested that the effect of OADG was stronger than those of the rest other carbohydrates to reduce the toxicity of p-APAO on cells of S. cerevisiae. The experimental results showed OADG and COS had clear effects on decreasing the toxicity of p-APAO on cells of S. cerevisiae. 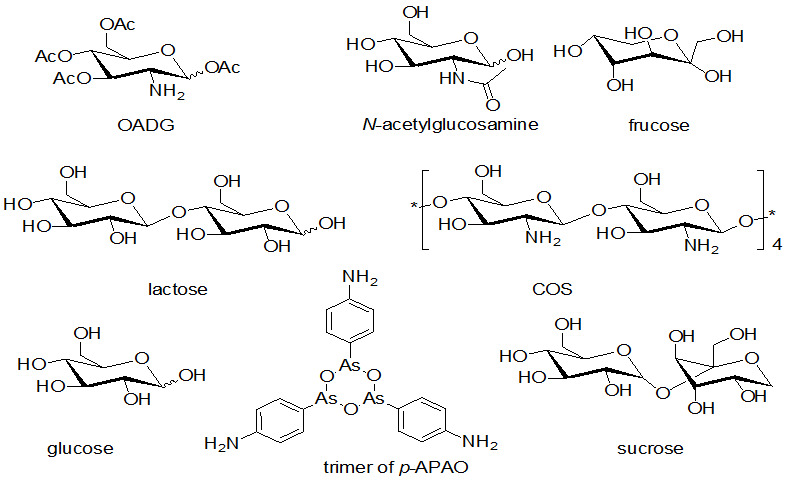 Figure 5: Effect of carbohydrates on p-APAO influence of the growth of S. cerevisiae: A: Control; B: As; C: As + OADG; D: As + glucose; E: As + fructose; F: As + N-acetylglucosamine; G: As + lactose; H: As + sucrose. Concentration of As: 80 mg/L, concentration of different carbohydrate: 12 g/L. 2) Intermolecular π-π interaction. Carbonyl in acetyl group interacts with conjugative π bond of benzene ring of p-APAO to form intermolecular π-π interaction, which plays an important role. In OADG there are four acetyls which could strengthen the π-π interaction with benzene ring of p-APAO, while there is none π-π interaction in the complex of other carbohydrate and p-APAO except N-acetylglucosamine with only one acetyl. Due to Intermolecular π-π interaction and Intermolecular hydrogen bonds, these interactions resulted in large hinders to inhibit p-APAO to form trimers (Figure 1). Trimer of p-APAO could be recognized by hexose carriers effectively. Intermolecular interactions of carbohydrates with p-APAO actually made R become larger hinder, which led p-APAO more difficult to be transported by hexose carriers. This resulted in decreasing heap of arsenic compound in cell. So the cytotoxicity of arsenic could be detoxified correspondently. OADG has four acetyls and one naked amino. Acetyl could form π-π interaction with benzene ring of p-APAO. Acetyl also could form hydrogen bonds with amine and hydroxyl groups in p-APAO. Naked amine in OADG could form the hydrogen bond with p-APAO, too. All the facts could explain the strong detoxification of OADG. There are other factors such as the interaction of naked amino with arsenic (III, As) acid. Naked amino group with stronger electron-donating ability than OH can form more stable complex. So glucosamine can form more stable complex than glucose and fructose. COS with amine and hydroxyl could form hydrogen bond with p-APAO, which could also reduce the heap of arsenic compound in cells of S. cerevisiae. COS had the ability of detoxification, too. Acetyl-modified OADG could strengthen its lipophilicity to penetrate cell wall more easily. According to the literatures in the absence of an enzyme the hydroxymethyl group of compounds, such as glucose, fructose can react with arsenate in neutral aqueous solutions to form esters[29,34]. It is easy for monosaccharides to form complexes with arsenite while not easy for disaccharides. Therefore these disaccharides had unobvious detoxification. In conclusion, we obtained the general information about S. cerevisiae with different concentrations of p-APAO (III, As) by microcalorimetry in our experiments. OADG and COS were found to have significant effects to lower the toxicity of p-aminophenyl arsenoxide on cells of S. cerevisiae. The effect of OADG was stronger than those of other carbohydrates. These results suggested that OADG and COS may be applied as the assistant antidote for p-APAO. These carbohydrates could interact with p-APAO via intermolecular hydrogen bonds or π-π interaction to form complex to inhibit p-APAO’s polymerization. This led p-APAO not easily to form the similar structure of hexose. So p-APAO couldn’t be recognized by hexose carriers effectively. OADG and COS had the capability of detoxification to p-APAO. This work was supported by National Natural Science Foundation of China (31371750) and National Natural Science Foundation of Hubei Province, China (2014CFB570). 1. (a) Zhu, J., Chen, Z., Lallemand-Breitenbach, V., et al. How acute promyelocytic leukaemia revived arsenic. (2002) Nat Rev Cancer 2(9): 705-714. (b) Zhang, X.W., Yan, X.J., Zhou, Z.R., et al. Arsenic trioxide controls the fate of the PML-RAR α on co-protein by directly binding PML. (2010) Science 328(5975): 240-243. 2. Bobé, P., Bonardelle, D., Benihoud, K., et al. Arsenic trioxide: a promising novel therapeutic agent for lymphoproliferative and autoimmune syndromes in MRL/lpr mice. (2006) Blood 108(13): 3967-3975. 3. Gortzi, O., Papadimitriou, E., Kontoyannis, C.G., et al. Arsonoliposomes, a novel class of arsenic-containing liposomes: effect of palmitoyl-arsonolipid-containing liposomes on the viability of cancer and normal cells in culture. (2002) Pharma Res 19(1): 79-86. 4. Sapra, A., Ramadan, D., Thorpe, C. Multivalency in the Inhibition of Oxidative Protein Folding by Arsenic (III) Species. (2014) Biochemistry 54(2): 612-621. 5. Swindell, E. P., Hankins, P. L., Chen, H., et al. Anticancer activity of small-molecule and nanoparticulate arsenic (III) complexes. (2013) Inorg Chem 52(21): 12292-12304. 6. Lloyd, N.C., Morgan, H.W., Nicholson, B.K., et al. The Composition of Ehrlich’s Salvarsan: Resolution of a Century-Old Debate. (2005) Angew Chem Int Ed Engl 44(6): 941-944. 7. Gibaud, S., Astier, A. Organoarsenicals derived from 2-phenyl-[1, 3, 2] dithiarsolan-4-yl)-methanol (AsIII) with antileukaemic properties: from trypanosomicides to anticancer drugs. (2007) Ann Pharm Fr 65(3): 162-168. 8. Koshiuka, K., Elstner, E., Williamson, E., et al. Novel therapeutic approach: organic arsenical (melarsoprol) alone or with all-trans-retinoic acid markedly inhibit growth of human breast and prostate cancer cells in vitro and in vivo. (2000) Br J Cancer 82(2): 452-458. 9. Heredia-Moya, J., Kirk, K.L. An improved synthesis of arsenic–biotin conjugates. (2008) Bioorg Med Chem 16(10): 5743-5746. 10. Avani, G., Rao, M.V. Toxicological effects of arsenic and its modulation by vitamin A in the brain and blood of Swiss albino mice. (2009) Toxicol Environ Chem 91(1): 65-74. 11. Song, X., Hu, X., Lü, S., et al. Incorporation of arsenic trioxide in induction therapy improves survival of patients with newly diagnosed acute promyelocytic leukaemia. (2014) Eur J Haematol 93(1): 54-62. 12. Diepart, C., Karroum, O., Magat, J., et al. Arsenic trioxide treatment decreases the oxygen consumption rate of tumor cells and radiosensitizes solid tumors. (2012) Cancer Res 72(2): 482-490. 13. Fu, M., Qin, C., Li, W., et al. Effect of glucosamine and chitooligomer on the toxicity of arsenite against Escherichia coli. (2013) Carbohydr Polym 91(1): 390-393. 14. Li, X., Li, B., Xu, Y., et al. Arsenic methylation capacity and its correlation with skin lesions induced by contaminated drinking water consumption in residents of chronic arsenicosis area. (2011) Environ Toxicol 26(2): 118-123. 15. McAlindon, T.E., LaValley, M.P., Gulin, J.P., et al. Glucosamine and chondroitin for treatment of osteoarthritis: a systematic quality assessment and meta-analysis. (2000) JAMA 283(11): 1469-1475. 16. Qin, C., Li, H., Xiao, Q., et al. Water-solubility of chitosan and its antimicrobial activity. (2006) Carbohydr polym 63(3): 367-374. 17. Kim, S.K., Rajapakse, N. Enzymatic production and biological activities of chitosan oligosaccharides (COS): A review. (2005) Carbohydr Polym 62(4): 357-368. 18. Vangsness, C.T., Spiker, W., Erickson, J. A review of evidence- based medicine for glucosamine and chondroitin sulfate use in knee osteoarthritis. (2009) Arthroscopy 25(1): 86-94. 19. Buckton, G. Applications of isothermal Microcalorimetry in the pharmaceutical sciences. (1995) Thermochim Acta 248: 117-129. 20. Zhang, L.X., Liu, Y., Cia, L.H., et al. 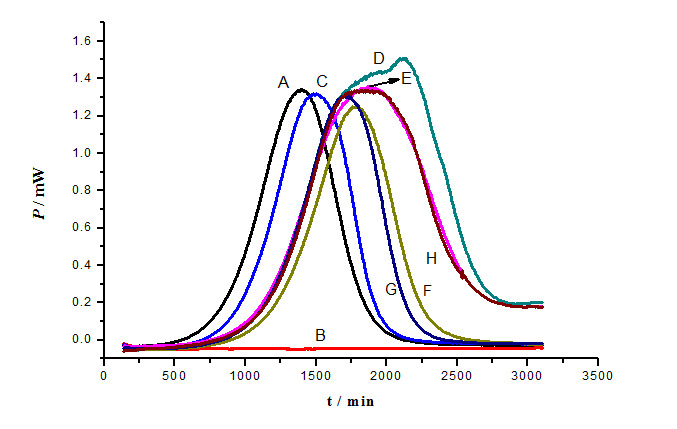 Inhibitory study of some novel Schiff base derivatives on Staphylococcus aureus by microcalorimetry. (2006) Thermochim Acta 440(1): 51-56. 21. Xu, X.J., Xue, Z., Qi, Z.D., et al. Antibacterial activities of manganese (II) ebselen–porphyrin conjugate and its free components on Staphylococcus aureus investigated by microcalorimetry. (2008) Thermochim Acta 476(1): 33-38. 22. Li, X., Zhang, T., Min, X., et al. Toxicity of aromatic compounds to Tetrahymena estimated by microcalorimetry and QSAR. (2010) Aquat Toxicol 98(4): 322-327. 23. Marison, I., Liu, J.S., Ampuero, S., et al. Biological reaction calorimetry: development of high sensitivity bio calorimeters. (1998) Thermochim Acta 309(1): 157-173. 24. Beezer, A.E., Mitchell, J.C., Colegate, R.M., et al. Microcalorimetry in the screening of discovery compounds and in the investigation of novel drug delivery systems. (1995) Thermochim Acta 250(2): 277-283. 25. Wernli, L., Bonkat, G., Gasser, T., et al. Use of isothermal Microcalorimetry to quantify the influence of glucose and antifungals on the growth of Candida albicans in urine. (2013) J Appl Microbiol 115(5): 1186-1193. 26. Wadsö, I. Isothermal microcalorimetry in applied biology. (2002) Thermochimic Acta 394(1): 305-311. 27. Wang, L. S., Peng, H. E., Li, W., et al. Effect of sodium selenite on microorganism growth in the presence of chitooligosaccharide. (2010) Food Sci (Chinese) 31(7): 196-198. 28. Peng, H.E., Qin, C.Q., Li, W. Antagonism of toxicity of ionic chemical toxicant to microorganisms by chitooligomer. (2009) Food Sci (Chinese) 30(9): 113-115. 29. Rosen, B.P., Tamás, M.J. Arsenic transport in prokaryotes and eukaryotic microbes. (2010) Adv Exp Med Biol 679: 47-55. 30. Moaddel, R., Sharma, A., Huseni, T., et al. Novel biotinylated phenylarsonous acids as bifunctional reagents for spatially close thiols: studies on reduced antibodies and the agonist binding site of reduced Torpedo nicotinic receptors. (1999) Bioconjug Chem 10(4): 629-637. 31. Stevenson, K.J., Hale, G., Perham, R.N. Inhibition of pyruvate dehydrogenase multienzyme complex from Escherichia coli with mono-and bifunctional arsenoxides. (1978) Biochem 17(11): 2189-2192. 32. Liu, Y., Duan, D., Yao, J., et al. Dithiaarsanes Induce Oxidative Stress-Mediated Apoptosis in HL-60 Cells by Selectively Targeting Thioredoxin Reductase. (2014) J Med Chem 57(12): 5203-5211. 33. Simanek, E.E., Huang, D.H., Pasternack, L., et al. Glycosylation of threonine of the repeating unit of RNA polymerase II with β-linked N-acetylglucosame leads to a turn like structure. (1998) J Am Chem Soc 120(45): 11567-11575. 34. Ren, J., Deng, Y., Cheng, J. Separation of monosaccharides and polylols in arsenite buffer by capillary electrophoresis with laser interference refractive index detection. (1995) Chin J Chromatogr 13: 244-244. 35. Ren, J.C., HE, J.L., Deng, Y.Z., et al. Rapid Separation of Disaccharides by Capillary Zone Electrophoresis with Interference Refractive Index Detection. (1993) Chem Res Chin Univ 14(12): 007.